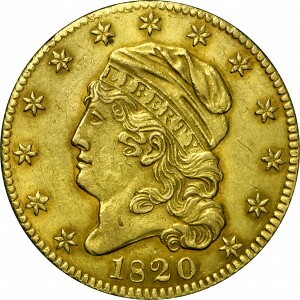 This is a final 1820 half eagle and fits the classification of Breen’s second group. 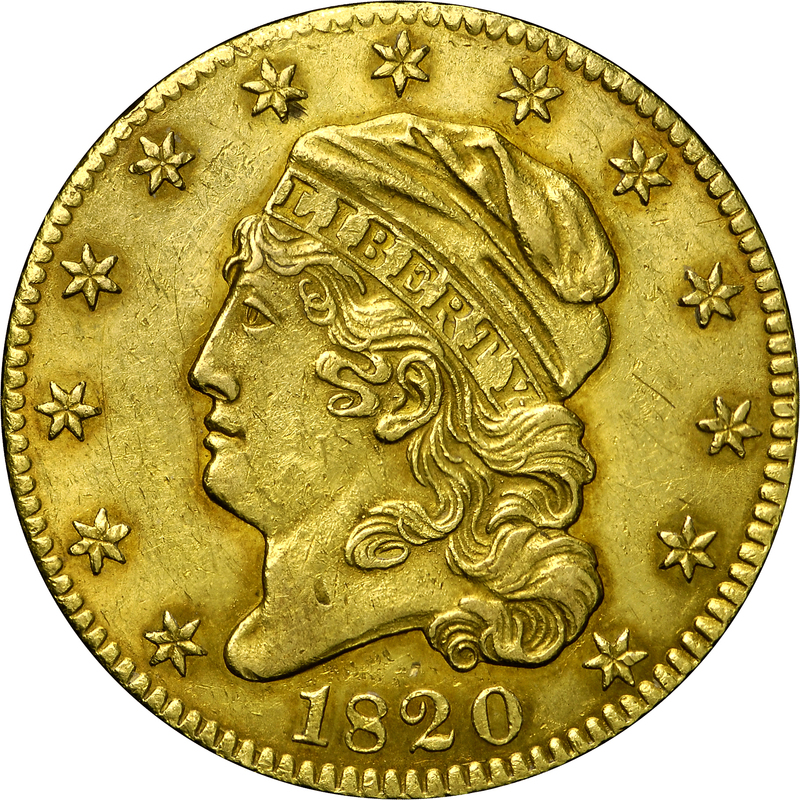 The obverse die is different from either obverse 3 or 4 as studied earlier, and was not recorded by Breen. 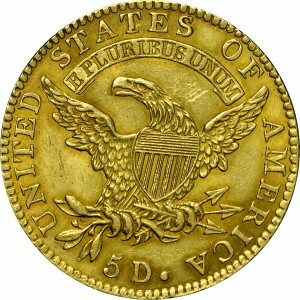 The reverse die of this example qualifies as reverse E, but Breen described that reverse as having small letters. 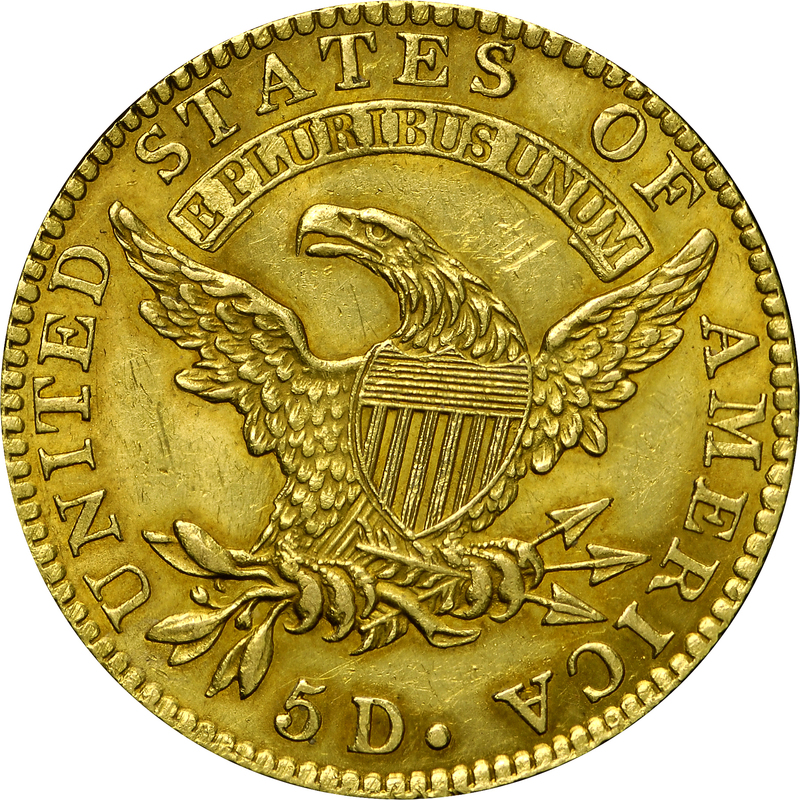 This is the only reverse with the lowest arrow pointing to I. When Breen prepared his monograph, he described the variety from lot 2388 of Henry Chapman’s sale of the George Earle Collection. The plate in the Earle catalogue is clearly a large letters example. From Superior's sale of the DeSylva Collection, February 1978, Lot 705. "Obverse: Curve-based 2. Belted 8. Sides of interior of 0 parallelized. Bottom tight curl bit to right of being centered over space between 2 0. 1 centered over denticle. Star 7 points at a cap angle. Die center punch in front of ear. Rust lumps below ear lobe, on face and neck, in hair, elsewhere. Reverse: Large letters. 'Punched' T (letter T has a triangular punch in bottom of upright. Used in other years.). S over E and space right. T over R and space right. S over S and space left. Base of E in line with that of adjacent T. Perfect M. Close 5D, top of 5 even with that of D. Large period. Tip of bottom arrowhead immediately below right base serif of I (distinctive). Adams 7."